Trilogy is a 55+ active lifestyle community in Redmond Ridge, a neighborhood in east Redmond. There are about 1,500 homes in Trilogy ranging from modest to upscale, built in the early 2000's around the Golf Club at Redmond Ridge. Homes for sale here include all the amenities Trilogy offers its residents, such as a communal cafe and living room, fitness center, spa, outdoor trails through the neighborhood, and a University of Washington learning center. The Redmond Watershed Preserve, 800 acres of forested trails for horseback riding, biking, and walking, and downtown Redmond are just minutes away. 2 Beds | 1.75 Baths | 1680 sq. Ft.
2 Beds | 1.75 Baths | 1870 sq. Ft.
2 Beds | 2.5 Baths | 2150 sq. Ft.
2 Beds | 2.25 Baths | 1871 sq. Ft.
2 Beds | 2.5 Baths | 2170 sq. Ft.
2 Beds | 2.5 Baths | 2310 sq. Ft.
2 Beds | 1.75 Baths | 1640 sq. Ft.
2 Beds | 2.5 Baths | 2585 sq. Ft.
2 Beds | 2.25 Baths | 2300 sq. Ft.
3 Beds | 2.75 Baths | 2695 sq. Ft.
Blue Summit Realty has the most accurate and up to date Trilogy real estate listings on the web. Currently there are 17 homes for sale, in Trilogy. Of the 17 total Trilogy residential listings for sale 0 are bank owned, 0 are short sales, 0 are new construction, and 0 are townhomes. The price ranges from $609,900 to $0 with a median list price of $872,829 and median sold price of $870,785. Make sure to refine your Trilogy real estate search by property type, price, square footage, bedrooms, bathrooms and more with the search tool above or view the Trilogy listings on our interactive map. 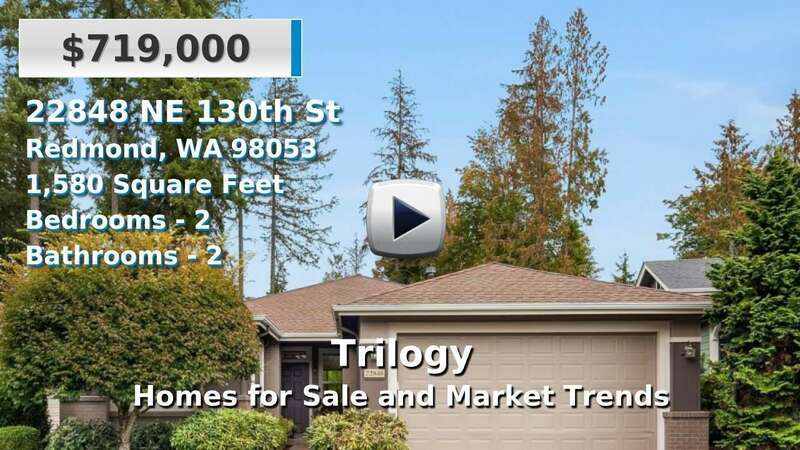 Our Trilogy real estate listings were updated 18 minutes ago.